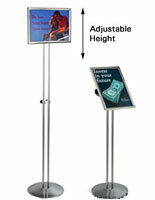 This poster stand, also known as a sign holder, adjusts in several ways for a truly customized display. 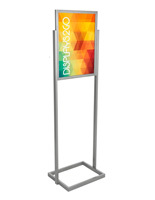 Designed to hold 18" x 24" signs, this poster stand is great for lobbies, entryways, and storefronts. 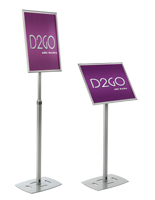 Each poster stand features a double metal pole stand, matching base, and a snap open sign frame. A matte silver finish add style, while flip open edges make sign changes quick and easy. 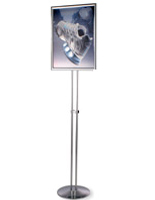 We sell this poster stand with an acrylic lens to reduce glare and keep your posters safe from damage. 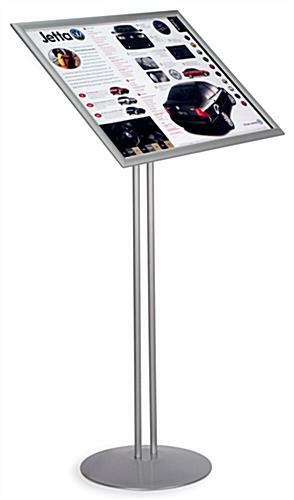 This poster stand offers a versatility and flexibility that you will not find in most sign displays. 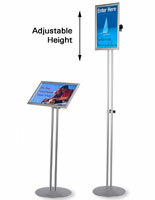 Each lobby sign, poster stand features an adjustable height that can move up and down to a position that you choose. 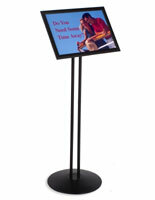 This poster stand can also hold the sign frame in the portrait or landscape position. 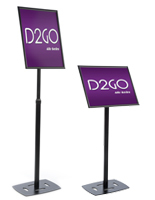 The sign holder tilts a full 180 degrees and can be placed to any desired viewing angle. Extend the height and place the frame straight on to hold posters and advertisements. Or, drop the height and tilt the frame back to use as a directory or menu holder. Whichever way you decide to use it, this poster stand will look great in any indoor location. We use this like a menu holder to stop foot traffic with a directional message. Assembly was easy and the two-post construction makes it quite sturdy. It's nice to know that when our needs change, we can easily change the height and orientation of the poster. We're getting great use out of it already! Love this display for our office signage We've purchased about 8-10 so far. Easy assembly, items packed well, shipping fast! Thanks for the awesome review Donna, we're glad you're happy with your order! This sign is perfect to use as a directory pedestal in our atrium. Great build quality! 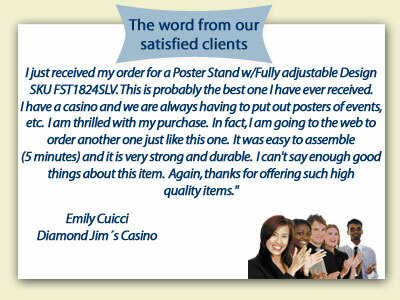 This poster stand is exactly what we were looking for--it allows us to easily market to people who come to our business. The frame snaps open in front so it's simple to switch out the poster. This is much more economical and more professional than using posters on foam coreboard. So convieant and easy to assemble, adjust and insert/remove posters. I keep multiple posters (4) in it at a time. As 1 event ends the other poster is in place and ready to go. The adjustable height it great too. I have 2 of these and sometimes place them in front of one another creating a nice sleek tiered look. The stand is heavy enough to put outside and not fear that the casual breeze will knock it down. Instead of glass there's a thin plastic that rests in front of the poster. Thanks for the feedback, Jackie! We hope to hear from you again soon.